Lexus's Multi Stage Hybrid System combines a 3.5-liter 295-hp V6 with a 59-hp electric motor to make 354 total horsepower, sent to the rear wheels. Unlike other Toyota and Lexus hybrids, the LC 500h's engine drives a conventional four-speed transmission mounted behind the hybrid electric motor. This allows for manual paddle shifting in "M Mode," a first for a Lexus hybrid, and the automaker says this drivetrain layout gives a more direct, one-to-one relationship between the accelerator position and vehicle speed, eliminating the strange motor-boat tendencies of other hybrids. Lexus says the LC 500h will do 0-62 mph in less than five seconds. 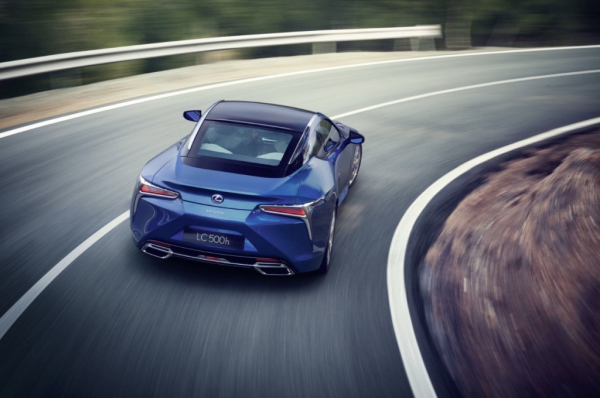 Onboard, the LC 500h is fitted with your typical Lexus safety features, like pedestrian detection, adaptive cruise control, and lane-keeping assists. On the outside, we're smitten with the coupe's low hood and athletic stance. Sharing bodywork with the striking LC 500, it looks muscular and agile. With Lexus committing to a hybrid variant of its new flagship coupe, it joins the company of high-end performance hybrids like the Porsche Panamera and the BMW i8. This is the future, and you can count us in.